This module is still in planning stage, however, 4 prototypes have been built yet. Take note that the layout of the module above is not the final design. sockets and knobs will be moved around to have a much more balanced layout. THIS MODULE HAS BEEN RELEASED AS DIY KIT AT THONK. 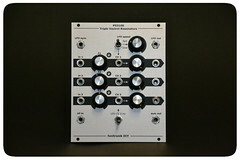 For more than 10 years i sell Resonator PCBs and Panels for DIY.